Overland Kailash Tour starts at Kathmandu Nepal and enters through Kerung boarder. 13 days tour plan have enough acclimatization, preparation time and exploration. 3 days walking around Mount Kailash, stay overnight at bank of Lake Manasarovar, explore typical Tibetan settlement, and back to Kathmandu Nepal at the end of the trip. Join our small group for Kailash Mansarovar Overland Tour. We are kailash tour operator based in Nepal has been operating group joining and private or small group Kailash Tour. We can provide you best option and customize itinerary as per your interest. Overland Tour to Kailash is starting from Kathmandu and enters Kailash via Kerung boarder. In optional route, it can be also from Kodari boarder if it get formally oprn. 13 days Kailash Overland Tour itinerary has enough time of preparation and acclimatization. 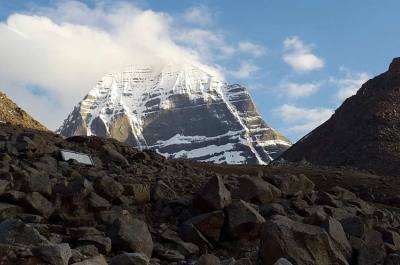 Mount Kailash at western Tibet is as holy mountain peaks that believe as residence of Lord Shiva and his wife Goddess Parvathi as per Hinduism. Abode of Kang Ringboche as per Tibetan Buddhism. It is bringing equal important in Jainism and Bon. Thousand of pilgrimages reach there every year. Taking bath at blue clean water of Lake Mansarovar believe to clean all the sins done in lifetime. 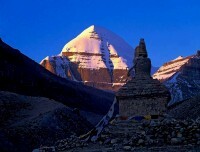 One circuit of Mount Kailash is said to be cleanup countless sins. 52 Kilometer Kailash circuit/ Kailash Kora or Kailash Parikrama is hardest part of the tour. It is containing 3 days trekking via highest mountain pass Dolma La (5,630miters). Although, it is not much tough for those who are physically fit. Rest of the days in tour is driving with comfortable transportation. The best season for Kailash overland tour is from May till September. For small private tour it is can be also suitable for month of April, October and November. After your breakfast in Hotel, our guide will lead you to sightseeing in kathmandu valley. Bauddhanath temple, Pashupatinath temple, Gujeswori and Jalanarayan. come back to hotel for lunch. stay at trip briefing and final packing after lunch. Early in the morning, take your pack breakfast from Hotel. Start driving toward Kerung boarder. It is 8 hours driving through Trishuli, Dhunche and Shyaprubesi to reach at Kerung immigration. After immigration formalities, drive to Tibet site of Kerung. It is 3,500 meter altitude. Drive to Saga from Kerung. It is about 6 hours driving through scenic landscape with some high passes about 5000 miter. Drive cross Bhrahmaputra River from Mount Kailash to reach Saga town. Saga is big Tibetan town before reaching Lake Manasarovar. You will have enough time to explore Lake and around. Peoples get holy bath at Lake and perform special worship to Kailash. After lunch here, drive to Darchen. it is only 40 kilometer drive take 1 hour. Darchen is base camp of Mount Kailash from here we start 3 days Kailash parikrama. Final preparation of Kailash parikrama. Drive valley of the god. It is also known as Yamadwor. Rough road driving takes almost 1 hours in 7 kilometers. Get horse and helper, peoples who have confirmed before with guide. Another 14-kilometer easy walk towards North Face of Kailash Dirapuk. Enjoy nearer view of Mount Kailash from here. Our staff will provide you simple Dinner. The second day of Kailash Parikrama is tough and long walking. Seriously uphills content up to Dolma La pass (5,630miters). Gaurikunda can be seen down after Dolma La at the base of hill. After crossing the pass, immediately down via rocky route till base of the mountain. Then another short walk at flat land reaches Juthulpuk. Third day of Kailash parikrama from Juthulpuk to Darchen, it is only about 3 hours easy walking. Meet you driving team and drive to Saga via Lake Manasarovar. If anyone need to fill holy water of Lake can do it today. Driving back through same way to Kerung from Saga. Today is last day of staying in Tibet. Kailash region. We have to start quite earlier tomorrow to reach at immigration and drive back to Kathmandu. Drive to Immigration from Kerung. It is about 40 minutes drive from Kerung town to immigration. After customs formalities, we say goodbye our Tibetan guide and driver team. get back to Nepal site and drive with Nepali vehicles. Transfer to Hotel. Day of final departure to Home. We drop you to International airport for your final departure. You normally have to reach airport before 3 hours from original flight time. Join us for Kailash Mansarovar small group joining tour from April month to month of October. This is small group of only foreigners peoples. Best service with reasonable cost is guaranteed. 13 days Overland tour starts and end at Kathmandu Nepal. 13 days Tour cost starts from 1280 $ per person. 25 April and 26 April, joining tour of Lhasa Kailash Kathmandu, reach at Lake Manasaroavar in full moon day. 3 days Kailash Kora and drive back to Kathmandnu via Kerung boarder. Accommodation in Kailash Overland Tour is in Hotel and Guesthouses. 3/4 star category hotel in Kathmandu. Guest house in entire Kailash is in group sharing room. Your do not need to sleep at tent the or at camp. Tour cost including basic guest houses only. Guest houses in Kailash region are similar in every stop. There is an option to make upgrading of Guest house in Darchen which is possible with your own extra cost. Kailash Yatra is group departure. We need at least 24 pax to make Kailash overland yatra, which makes your reasonable tour cost. Group size may go more than 24 pax in one single trip. Any group size private trip can be also arranged with different cost. This is small group tour of foreigners and Nepali passport holder, other than Indian. Group size is not more than 10 peoples. 13 days tour plan is Overland Tour starts from April month till October. Most of the tour plan is on BB, accommodation in comfortable hotels and guest houses. Use foods from local restaurants. One of the experience coordinator from Nepal and Tibetan guide will lead the group. Same type of tour is also operating as small joining tour from Lhasa as Lhasa Kailash Tour.